Compliance for Regulatory, Safety, Contract Management, Trading, IT and NERC for the Energy, Utilities, Generation, Transmission, Oil and Gas, Liquefied Natural Gas (LNG), Water Treatment and industrial services. 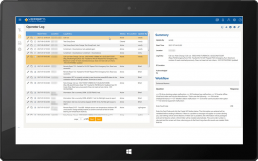 Capture and organize corporate compliance on a single platform. Versify’s Compliance provides a comprehensive solution to manage compliance events, evidence collection, organization and reporting. Reduce the time spent on manual compliance procedures, forms, emails and spreadsheets. Workflow enable business processes with electronic forms and questionnaires. Streamline operations, ensure compliance and improve accuracy and retention. Versify’s Compliance software can be customized to each client’s needs and is able to collect, store and analyze large amounts of data in real-time. This incredible tool will free up your personnel and give you the peace of mind that you need during compliance audit time.